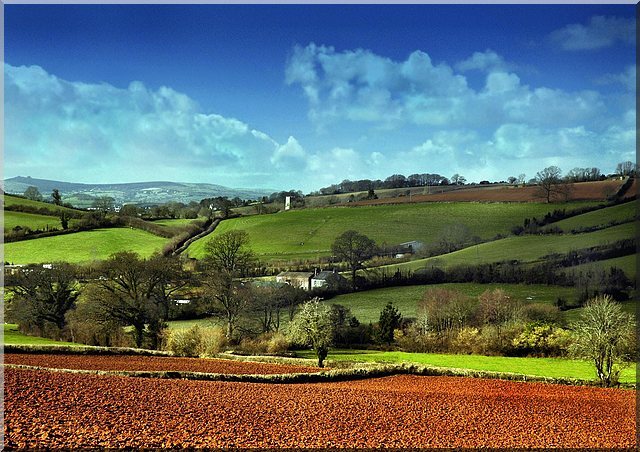 Typical Devonshire Countryside you will find on your Devon farm holidays! Devon farm holidays invites you to stay in delightful farm accommodation. Here you will find a wealth of English country cottages to choose from in our listings of self-contained farm cottages and farm bed and breakfasts. All offer quality accommodation at reasonable rates. If you are looking for cheap accommodation in a peaceful setting within the heart of the English countryside then look no further. You are sure to find a holiday rental or holiday let that suits your needs. This is the county famous for Devonshire Teas where you throw cholesterol caution to the wind and indulge in split scones, strawberry jam and clotted cream straight from the farm. Delicious! It certainly beats cucumber sandwiches any day of the week! However, it is not just teas and cider that the country is famous for. Your farm holiday will bring you in contact with an area of outstanding beauty with a fabulous coastline. There are 2 National Parks, the Exmoor and Dartmoor, which offer a stark beauty all of their own and offer walkers plenty of walking opportunities. There are extensive networks of public footpaths and bridal ways through farmland and woodland. For the more energetic the The Two Moors Way is a long-distance foot way that crosses through Mid-Devon. Other farm holiday activities that one can do in the area include cycling, golf, horse riding and fishing. Devon farm holidays are fun for everyone! Have a look through our holiday rentals and find just the right country cottage or country farmhouse for your next farm holiday. If you have a farm in Devon that you would like to showcase visit our Farm Forum. You can upload a picture and brag a little. We don't mind! Share a farming story, tell us about your best or worst farm holiday and lots more. There are other individual farming discussion boards to contribute to through this forum, as well as a Craft & Recipes Forum where you can share your favorite recipes and also get some crafting ideas for various arts & crafts. Feel free to browse the books below on Devon. You may find something of interest for you next holiday in Devon.